This post is part of The Writer's International Culture Share, in which writers discuss their personal experience with world cultures: Harry Markov discusses Saint George's Day, May 6th, in Bulgaria. 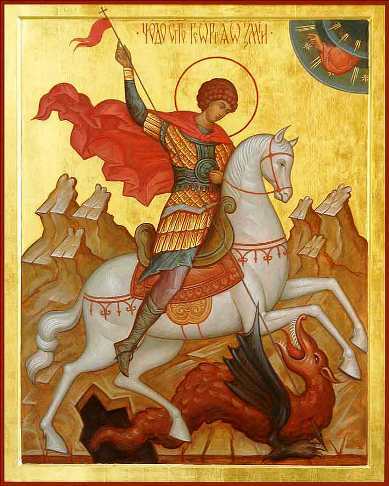 May 6th is an important day for Bulgaria as we celebrate Saint George, who in Bulgaria is referred to as the Dragon Slayer or the Victorious (though literally from Bulgarian that one should be Victory Bringer). 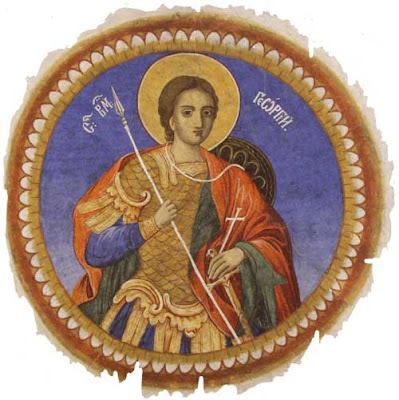 Saint George is the patron of farmers and shepherds. By default, all the people having names that remotely resemble George have a Name’s Day and celebrate: these include Georgy (Bulgarian version of said name ), Gergana, Gergina, Gloria, Gancho, Ginka, Ganka, Gabriella, Genady, Gosho, Genovena and many more. Saint George’s Day is a big deal in Bulgaria for several reasons. 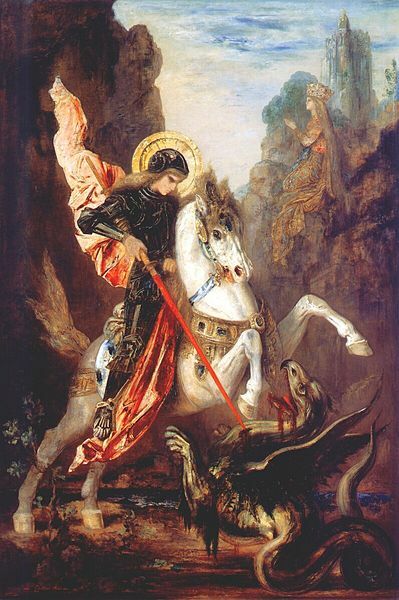 For starters, Saint George is a saint of significance in the Christian pantheon. Because of his brilliant military career, Saint George’s Day also coincides with Day of Bravery and the Bulgarian Army. The tradition is alive and well - on the morning of May 6 all the news stations provide live feed from the army’s parade in the capitol as soldiers march to Alexandr Nevski’s Church. The ritual I noted this year was the blessing of the battle flags, though specific attention was paid to the Navy and their battle ships. I suppose that this specificity has to do with the legend that a healing water gushed after a church in the saint’s name was raised on the site where he killed the dragon. It’s because of that particular feat why Saint George is one of the most recognizable saints in the Eastern-Orthodox mythology. In itself the legend doesn’t shock at all as it’s pretty straight to the point. In a true Greek fashion, we have a city located near a lake, which in turn was the home for this dragon. The dragon was a fierce poison breathing monster, whose breath could kill a person even from a solid distance. As a means to keep the beast away from the city, which had become the dragon’s go-to location for meals, the city ruler decided that each day a child would be left at the lake’s shore, inventing the first take-out delivery service for dragons anywhere (in Christian mythology). Improper jokes aside, it was the city ruler’s young daughter to be eaten by the dragon, when Saint George appeared on a white horse and slew the dragon in the name of God as it emerged from the waters. This act – no one could previously kill the beast – was meant as a miracle so that God could convert the whole city into his followers. I suspect this particular myth served as the foundations for the knight on a white horse, who slays dragons and saves princesses. Saint George is honored as a martyr. You remember the bit about his military career? Well, in fact, George served as a Roman soldier under the Emperor Diocletian. George proved himself to be a brave and honorable soldier, but that didn’t mean much when Diocletian decided to clean his army from Christians. Initially, George was picked to head the team that would be in charge of finding and killing Christians, when he himself revealed his love for God. Diocletian tried to convert his best soldier to Roman beliefs, but when no offering convinced George to abandon Christ, tortures and decapitation followed. It was during these torture sessions that George performed countless miracles. He survived inhuman lashings, spending three days in a quicklime pit, poison and even swords grating his whole body. During his trial an angel appeared in order to heal George and in the end, at the command of the Emperor, he even resurrected a dead man. Harry Markov lives in Varna, Bulgaria. This post originally appeared at his blog and is reprinted here with his permission.